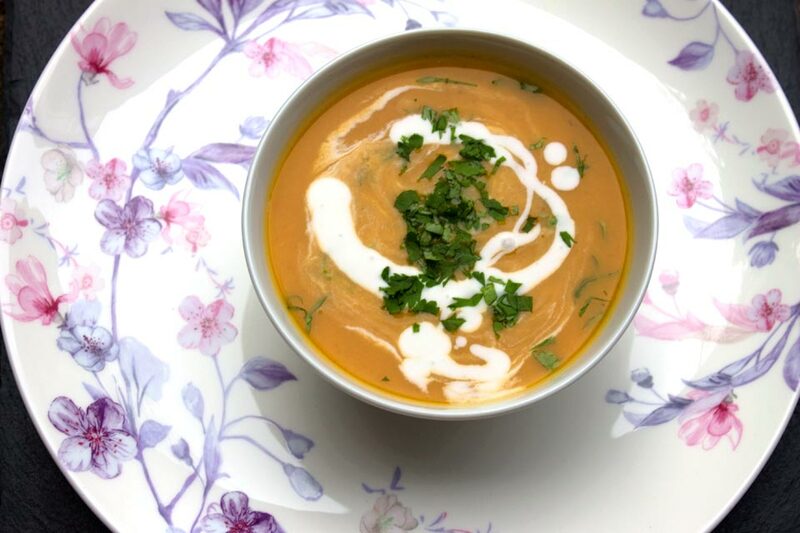 There are some taste combinations that just seem made for each other and some spicy heat with butternut squash and coconut milk seem like one of them to me. If you think so too you should really like this soup. This is a nice warming soup, very filling and comforting. There a nice kick of heat from the Balti Curry Sauce but that’s nicely mellowed out with some coconut milk. And of course this is another abitmoreveg recipe. 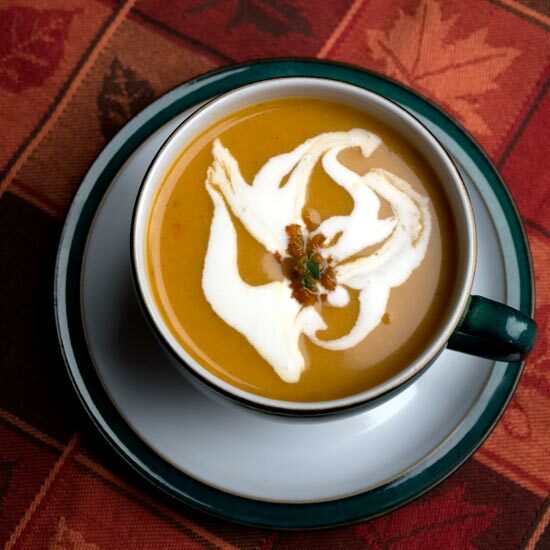 A spicy butternut squash soup mellowed out with some coconut milk and topped with some fresh coriander. Butternut squash is very rich in vitamin A, carotenoids and fibre, among other things. A good winter vegetable to get you through the winter, or any time. The heat from the balti curry sauce is nicely balanced with some coconut milk, which is also reputed to be quite good for your health. This soup is quite sweet as it is but because it’s still winter and because I’m still craving sugar and warmth I added a 2 tablespoons of maple syrup to the soup. I also added some ground cardamon. I love the smell and taste of cardamon but I can rarely taste it in a cooked dish. I still like to add a little though. The soup is quite sweet without these additions so I’m listing them as optional. Butternut squash skin is edible if you roast it. It can make for a tasty garnish. I didn’t bother doing that this time but if you’re going to just be sure to buy organic and scrub the skin well first. 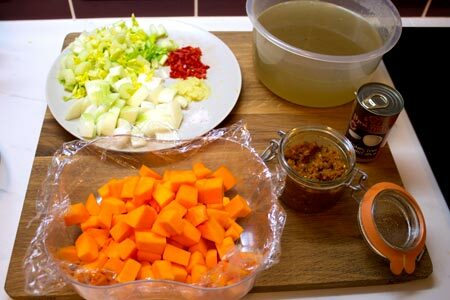 Butternut squash, onion, celery, red chilli pepper, ginger, Balti curry sauce, Thai coconut milk, vegetable stock and salt. Heat a little oil in a suitable deep saucepan. Add the onion and celery, cover and leave for a couple of minutes to sweat on a gentle-moderate heat. Add the chillies, ginger and salt, stir in well, cover and leave for 5 minutes. Add the butternut squash, cover and leave for 20 minutes. Stir in the balti sauce, cover and leave for a further 5 minutes. 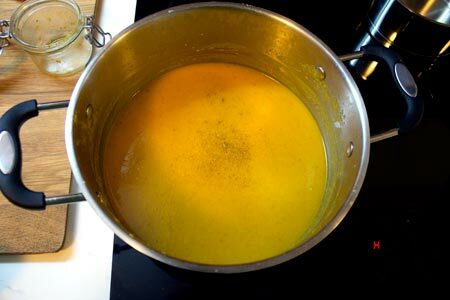 Stir in the vegetable stock, increase heat to maximum and bring to the boil. Reduce heat and leave to simmer for 10 - 15 minutes. Blend to a smooth consistency. Add in two-thirds of the coconut milk and reserve the other third in a jar for decorating - this way you can shake it up to the right consistency. I did add a couple of things to the ingredient list as i went along – maple syrup and ground cardamon.